Welcome again to As It Is, your daily magazine show from VOA Learning English. Today, we hear about ethnic conflict in western China, deep in the Asian continent. Then, we take a cultural turn. We learn about the many Chinatowns in the United States. Chinese immigrants have lived and worked in America since the 1800s. As we will hear, Chinatowns can be population centers of people of Chinese ancestry, or they may be tourism centers. Today, many cities have their own Chinatowns, including Washington, DC. Chinese officials are increasing security in the western area of Xinjiang after a series of deadly incidents killed at least 35 people. The Xinjiang government announced that it will pay up to $16,000 to people who provide information that helps officials investigate the violence or capture the people involved. The provincial government in the capital, Urumqi, says additional security measures have been put in place. Pictures on the Internet show thousands of officers from the People’s Armed Police deployed in the city. The show of force is the largest since 2009, when ethnic riots between Muslim Uighurs and Han Chinese killed about 200 people. 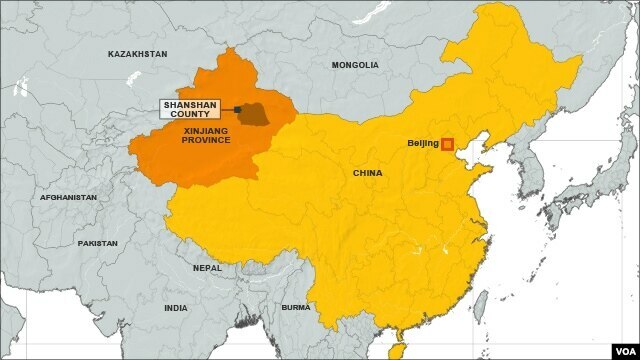 The most recent violence took place in Shanshan county’s Lukqun area. China’s official Xinhua news agency says an unidentified group attacked police stations, a local government building and a construction area. They say 24 people were killed, including two police officers. Xinhua says police opened fire, killing 11 people. It says 16 of the dead were Uighurs, the mainly Muslim ethnic group of the area. Other unrest has been reported. On Friday, reports say about 100 people clashed with police after a raid on a local mosque in the city of Hotan to the south. There is a history of ethnic conflict in Xinjiang. Ethnic Uighurs are mainly Muslim and rural. The Chinese government says Uighurs represent 45 percent of the province’s population. Han Chinese, people whose ancestry is from China’s eastern provinces, make up 40 percent. However, Han Chinese have increasingly settled in the area. Uighurs say they are being turned into a minority in their homeland and that their culture is suppressed. On Friday, a spokesman for the American State Department, Patrick Ventrell, expressed deep concern about continuing reports that Uighurs and Muslims in China suffer discrimination and restrictions. China’s official media have blamed Western countries for inciting extremism in Xinjiang. China says unrest in the area is the result of terrorism. A Chinese Foreign Ministry spokeswoman urged the United States to increase anti-terrorism cooperation with other nations. People from China have been in the United States since the middle of the 1800s. Today, Asians are America’s fastest growing minority. Steve Ember has this story. Richard Rodgers and Oscar Hammerstein II wrote a Broadway musical in the late 1950s called “Flower Drum Song.” It was about generational conflict in Chinese-American families in San Francisco’s Chinatown. In “Grant Avenue,” Pat Suzuki joyfully sang of the attractions that brought visitors to the downtown Chinese community. 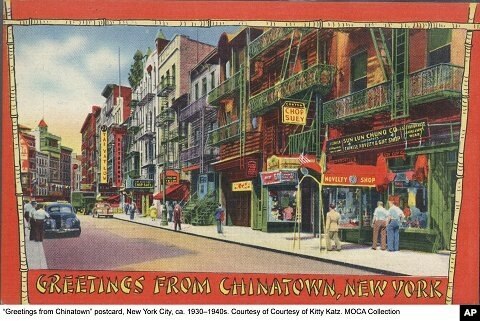 A mid-century postcard for tourists shows New York City's Chinatown. From San Francisco to New York, people visit Chinatown for restaurants, grocery stores, herbal cures, and other businesses. But many Chinese have moved out of traditional Chinatown neighborhoods and now live in suburbs just outside the inner city. For example, one of the largest mainly Chinese suburbs is just outside Los Angeles, California. But such areas are very different from the old Chinatown. Steve Wong is acting director of the Chinese American Museum in Los Angeles. He says Chinatowns in major American cities are now mainly for tourists. But at one time, Chinatown was the only place where Chinese immigrants could live. The first Chinese immigrants arrived from southern China in the 1800s as laborers. Many worked on building America’s first railroads. Then, in 1882, the United States banned Chinese immigration. Hostility toward the Chinese led to the creation of Chinatowns. Steve Wong tells about how the neighborhoods developed. Min Zhou is a professor at the University of Southern California Los Angeles. In the past thirty years, Chinese immigrants from Taiwan, and then China, came to America as students – and then stayed in the United States. She describes their arrival.